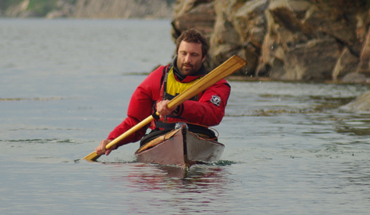 It's easy to learn to paddle with a Greenland paddle. Especially for a beginner, who has never paddled before, it should be quite natural. 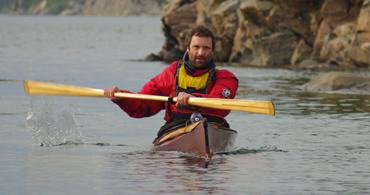 It may feel strange for those who have paddled a lot, but the uncertainty is usually overcome quickly. We can start by holding the paddle: the paddle should feel good to hold. The shaft defines where you should put your hands - just before, or partly on, the transition to the blade of the paddle. The paddle is symmetrical, so there's no wrong way you can hold it. The main rule is that you should feel your way forward, and test - eventually you'll sense what's appropriate for you. Usually the distance between your hands will be equal to the width of your shoulders, or slightly greater in some cases. 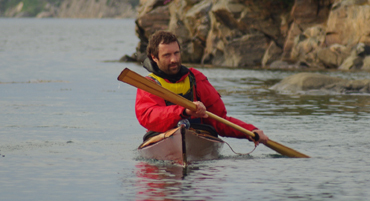 I usually don't give any instructions ahead of time, when I teach paddling with a Greenland paddle - it tends to come naturally, and can be practiced without further instruction. Put the paddle in the water reasonably far ahead - don't lean too far forward. You can put the paddle in the water at a right angle, or angled slightly forwards. Guide the oar backwards, first with a little effort, then eventually more, until the stroke finishes slightly behind your upper body, and you put the other paddle blade in the water on the opposite side. 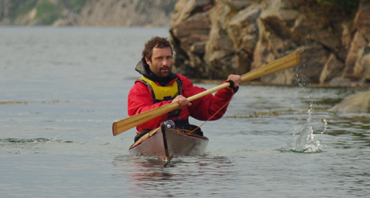 The paddling technique is not substantially different from the one used with modern paddles. Leverage against the foot pedals is important, here you start rotation in the pelvis and upper body, which makes it easy to put large amounts of muscles to use in the back, shoulders and stomach. 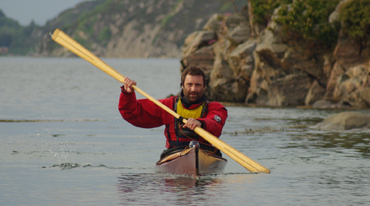 This lightens the load on the relatively small muscle groups in the arms, and the paddling is not tiresome. You both pull and push the paddle in the same movement, and the pushing hand can loosen its grip somewhat. Partly so you can be conscious of the pull/push dynamic, partly to keep your fingers moving and avoid cold and stiffness. How high a paddle position to use is also a matter of taste. It is often asserted that the position should be low with this type of paddle. But it's more a case of low positions being natural for a lot of people, especially when combined with a low kayak that lies deep in the water, as is typical for a Greenland kayak. The normal position with a Greenland paddle is slightly less than 45 degrees. For many people who are used to normal, rotated paddles this may feel strange. Many continue to rotate the paddle, and this may cause some instability. This quickly decays by itself - usually after a few kilometres of paddling. Then there's the question of splashing for a lot of people! Splashing often happens at the start, just as the paddle is lowered into the water. The blade's form may be at fault to some extent, but it's usually the way it's put into the water that there's something wrong with. If you experience splashes, try delaying applying force to the paddle stroke until the paddle is completely submerged. You have to feel your way forward with the blade, to discover how it's least disturbing. When that's accomplishes, the paddling technique is essentially in order. The biggest challenge that's left, is for most people to use their arms less and rotate their body more.